Sometimes people feel like they have a cavity when they don’t, and others may have cavities and not even know it! In the earliest stages of a cavity, there may be no symptoms. There are no nerves in your tooth’s enamel, so when the decay is in that layer, it’s likely that you won’t feel a thing. Once the decay has progressed enough to reach the softer tissues inside the tooth, you might experience some symptoms. You might feel some pain after eating sweets, hot foods or cold foods. The pain might be fairly mild or it might be sharp and intense. Cavities sometimes create visible holes in the teeth. Cavities may create stains that are black, brown or white on the surface of the tooth. 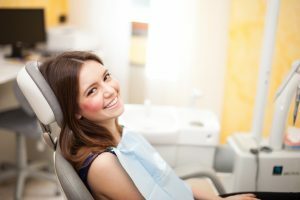 What should you do if you think you have a cavity? See your dentist! Although cavities can be reversed in the early stages, by the time you are feeling discomfort or pain, only a dentist can treat them. An x-ray will be taken to determine how the cavity has progressed into the tooth. Depending on how severe the cavity is, you might need a filling to fix it. If the decay is very severe, the dentist might replace the tooth with a crown or perform a root canal. Even if you’re not sure if you have a cavity, regular professional cleaning and dental visits are important. As with many conditions, when it comes to cavities, taking preventative steps is a lot easier than treating the problem down the road.